Accuphase put a lot of thought into the volume knob, which is connected to a sensor that sends position information to the microprocessor for proper volume adjustment. Accuphase says the volume knob is extruded from a solid aluminum block and mounted to a large diameter shaft. This is said to provide the right amount of inertia when combined with the low-friction internal mechanism, and to ensure smooth feel and quiet motor operation (when using the remote control). The operation of the volume knob during evaluation seemed to confirm the stated goals of the manufacturer. The display panel shows a digital readout of the selected input and volume level. Additionally, there are indicators for output (inv, off, and external pre), recorder (on and play), attenuation (-20dB), and the loudness-compensation network (a three-position loudness compensator that boosts low-end presence). Pressing the button for the subpanel opens the drawer and reveals button controls for display, phase (phase inversion can be set individually for each channel), mono, and recorder. Rotary switches for output (ext. pre, all, bal, line, off), gain (12dB, 18dB, 24dB), balance (+/– 4dB L-R), compensator (off, 1, 2, 3), and ’phones level (low, med, high) are also accessible. 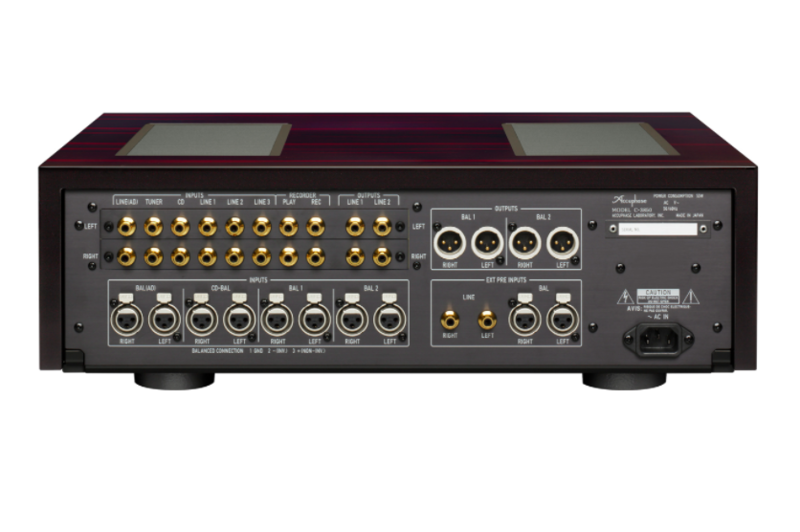 The rear panel features four balanced XLR inputs, six single-ended inputs, two sets of balanced XLR outputs, two sets of single-ended outputs, one set of recorder playback-and-recording single-ended inputs and outputs, a set of external preamplifier inputs (single-ended and balanced), and the AC power supply IEC connector. The supplied remote control (RC-210) has buttons for input selection (direct or toggle), volume adjustment, and attenuator on/off. There are five additional buttons for CD/SACD player control (stop, play, pause, back, and next) that will operate Accuphase disc players. Setting up the C-3850 is relatively straightforward. In addition to making the usual connections for input source components and output, the user has options for a few additional settings. The loudness compensator can be engaged at various levels if the user needs/desires more low-frequency presence. (In this evaluation the compensator feature was tested for functionality but not used during normal listening sessions.) Depending on the output cable configuration, the output control can be set for an external preamp (e.g. home-theater bypass—not tested), balanced, single-ended, or balanced and single-ended. The volume level display can be adjusted to work in attenuation mode (default) or gain mode; both modes were used in this evaluation. The C-3850 is set for pin-3 “hot” on the XLR input and output. Depending on the input source and the amplifier connected to the output, the individual input phase inverter can be activated to adjust for any condition. If the user gets confused, the instruction manual has a usage table to help set the phase (inverted or non-inverted) for all of the connections. The gain setting can be set for 12dB, 18dB, or 24dB. In every configuration in which the C-3850 was used, the preferred gain setting was 24dB, which yielded more dynamic and rhythmic drive on all types of music. The P-7300 stereo power amplifier is rated at 125Wpc into 8 ohms, 250Wpc into 4 ohms, 500Wpc into 2 ohms, and a stable 800Wpc (music signal) into 1 ohm. Maximum output power in normal operating mode is listed as 220Wpc, 383Wpc, 620Wpc, and 899Wpc respectively. The P-7300 replaces the P-7100 introduced in 2006. Like the C-3850, the P-7300 improves on the older design, utilizing the same advancements and experience Accuphase has gained over the years. The P-7300 boasts improved signal-to-noise ratio and a higher damping factor than the P-7100 it replaces. Internally, the P-7300 contains a large newly developed toroid transformer in the power supply with a total of 112,000 microfarads of filter capacitance. The input stage is a low-noise instrumentation-amplifier topology designed with discrete components in a balanced configuration. Further improvements in the Multiple Circuit Summing (MCS+), which uses multiple circuits paralleled in the same configuration to reduce noise and improve performance, have been extended to the Class A drive stage of the I-V converter. The output stage uses 10 parallel push-pull (20 total) bipolar output transistors per channel. These transistors are directly mounted to the large die-cast aluminum heatsinks on either side of the amplifier that dissipate heat generated by the circuits. A current feedback circuit is utilized to achieve negative feedback in an effort to keep the feedback circuit impedance low and phase shift at a minimum. The outside of the P-7300 has a golden-hue metal front panel with the die-cast aluminum heatsinks integrated into the chassis to form the side panels. On the rear of the amplifier are two sets of speaker terminal binding posts (for bi-wiring) for both left and right channel outputs, single-ended (and balanced) inputs for each channel, a balanced input phase selector switch, and an IEC AC power supply. Additionally, there is a rotary selector switch for the amplifier configuration: normal mode for stereo operation, dual mono mode for bi-amping, and bridge mode for monoblock operation (500Wpc into 8 ohm, 1000Wpc into 4 ohm). On the front panel, the amplifier has a 4-stage gain-selector rotary switch that has a max setting (28dB of gain) with additional adjustable settings of –3dB, –6dB, and –12dB (relative to the max setting). Next to the gain-selector switch is an input-selector button (single-ended or balanced), a main power button, and a power-meter-control rotary switch. The power-meter-control selections are off, normal, 3 SEC (peak hold for 3 seconds), and infinite (infinite peak hold). The center of the front panel houses the power meters for both channels. Above the left power meter are hold indicators for the power-meter-control settings (3 seconds or infinite), while function indicators (bridge mode, dual mono, single-ended, and balanced) are above the right power meter.